Most semesters, I offer the class a final paper where the assignment is to “find a poem that you LOVE and then create both a research paper and ‘digital essay’ that represent the questions and ideas the poem urges you to explore.” I offer the students a number of different links to sites where they can read a lot of different kinds of poetry (poets.org, The Poetry Foundation, PennSound, and others), along with a wide variety of discrete poems that we investigate in class. But, most students choose not to work with a poem that was “assigned,” which means that each semester I find myself wondering how they found the poems they chose to work with. In my last post, I focused on Adrienne Rich and CUNY, with a particular emphasis on poet as composition instructor. 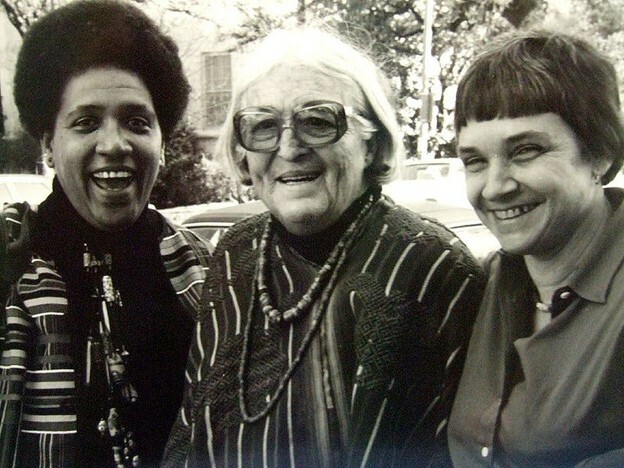 Audre Lorde, like Rich, was also proudly linked to the CUNY system — as student and teacher (at Hunter, John Jay, City College, and Lehman College). Lorde also began her teaching career in the SEEK Program at City College — hired by Mina Shaughnessy. I like to assign Lorde’s work, and usually look at a few short essays (from Sister Outsider) and a few poems (from The Black Unicorn). When students choose to write on Lorde for their final paper, they tend to choose something we’ve already done together in class. But, this semester, the students who worked with Lorde picked poems that they found on their own — poems that seemed to really change how they approached writing, even though the writing we do is “academic,” thesis-driven, not necessarily poetic. Audre Lorde made me think that sometimes writing doesn’t always have to be the “usual” — you must be yourself when you write. Before I had ideas and when I was in front of a blank page my ideas ran away. Lorde’s style influenced me to want to write in a way to that people could see me through the paper. This statement reminds me of Lorde's "Difference and Survival" (a speech given at Hunter College), in which she states, "if the difference has been defined for us in our introductory courses as good, meaning useful in preserving the status quo, in perpetuating the myth of sameness, then we try to copy it..." (I am your sister 201). In other words, Lorde reminds us that the purpose of general education courses is not to train us to repeat, and particularly in first year writing courses it is imperative that students somehow learn to see their own voice voicing ideas and opinions. **The student mentioned, Leyda, collaborated with me on this post — she agreed to have her name included and was generous enough to share some of her own reflective and process writings with me to quote here. Lorde, Audre. The Collected Poems of Audre Lorde. New York: Norton, 1997. Print. ------. I Am Your Sister: Collected and Unpublished Writings of Audre Lorde. Ed. Rudolph P. Byrd, Johnnetta B. Cole, and Beverly Guy-Sheftall. Oxford: Oxford UP, 2009. Print.